Today is the birthday (1897) of Sir Charles Edward Kingsford Smith MC, AFC, often called by his nickname Smithy, brilliant Australian aviator. In 1928, he earned global fame when he made the first trans-Pacific flight from the United States to Australia. He also made the first non-stop crossing of the Australian mainland, the first flights between Australia and New Zealand, and the first eastward Pacific crossing from Australia to the United States. He also made a flight from Australia to London, setting a new record of 10.5 days. All right, I will confess. I collect Australian stamps and covers. I have 5 first flight covers carried by Kingsford Smith including one with his autograph. Treasures. At 16, Kingsford Smith became an engineering apprentice with the Colonial Sugar Refining Company. In 1915, he enlisted for duty in the 1st AIF (Australian Army) and served at Gallipoli. Initially, he performed duty as a motorcycle dispatch rider, before transferring to the Royal Flying Corps, earning his pilot’s wings in 1917. In August 1917, while serving with No. 23 Squadron, Kingsford Smith was shot down and sustained injuries which required amputation of a large part of his left foot. He was awarded the Military Cross for his gallantry in battle. As his recovery was predicted to be lengthy, Kingsford Smith was permitted to take leave in Australia where he visited his parents. Returning to England, Kingsford Smith was assigned to instructor duties and promoted to Captain. On 1 April 1918, along with other members of the Royal Flying Corps, Kingsford Smith was transferred to the newly established Royal Air Force. On being demobilized in England, in early 1919, he joined Tasmanian Cyril Maddocks, to form Kingsford Smith, Maddocks Aeros Ltd., flying a joy-riding service mainly in the north of England, during the summer of 1919, initially using surplus DH.6 trainers, then surplus B.E.2s. Later Kingsford Smith worked as a barnstormer in the United States before returning to Australia in 1921. He did the same in Australia and also flew airmail services, and began to plan his record-breaking flight across the Pacific. Applying for a commercial pilot’s license on 2 June 1921 (in which he gave his name as ‘Charles Edward Kingsford-Smith’), he became one of Australia’s first airline pilots when he was chosen by Norman Brearley to fly for the newly formed West Australian Airways. In 1928, Kingsford Smith and Charles Ulm arrived in the United States and began to search for an aircraft. 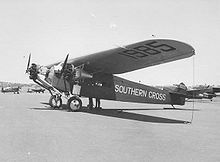 Famed Australian polar explorer Sir Hubert Wilkins sold them a Fokker F.VII/3m monoplane, which they named the Southern Cross. A similar aircraft, the Bird of Paradise, had made the first trans-Pacific flight from California to Hawaii for the United States Army Air Corps the year before. At 8:54 a.m. on 31 May 1928, Kingsford Smith and his 4-man crew left Oakland, California, to attempt the first trans-Pacific flight to Australia. The flight was in three stages. The first, from Oakland to Wheeler Army Airfield, Hawaii was 3,870 kilometers (2,400 mi), taking an uneventful 27 hours 25 minutes (87.54mph). They took off from Barking Sands on Mana, Kauai, since the runway at Wheeler was not long enough. They headed for Suva, Fiji, 5,077 kilometers (3,155 mi) away, taking 34 hours 30 minutes (91.45mph). This was the most demanding portion of the journey, as they flew through a massive lightning storm near the equator. The third leg was the shortest, 2,709 kilometers (1,683 mi) in 20 hours (84.15mph), and crossed the Australian coastline near Ballina before turning north to fly 170 kilometers (110 mi) to Brisbane, where they landed at 10.50 a.m. on 9 June. The total flight distance was approximately 11,566 kilometers (7,187 mi). Kingsford Smith was met by a huge crowd of 26,000 at Eagle Farm Airport, and was welcomed as a hero. Australian aviator Charles Ulm was the relief pilot, and the other crewmen were James Warner, the radio operator, and Captain Harry Lyon, the navigator and engineer. 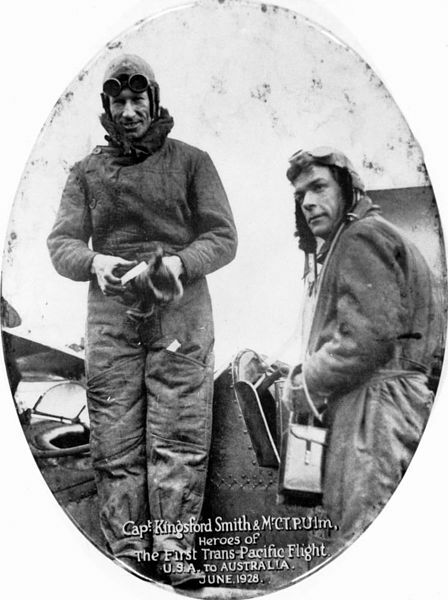 Sir Charles Kingsford Smith and co-pilot John Thompson “Tommy” Pethybridge were flying the Lady Southern Cross overnight from Allahabad, India, to Singapore, as part of their attempt to break the England-Australia speed record held by C. W. A. Scott and Tom Campbell Black, when they disappeared over the Andaman Sea in the early hours of 8 November 1935. Despite a brave search for 74 hours over the Bay of Bengal by test pilot Eric Stanley Greenwood OBE, their bodies were never recovered. I have no idea what Kingsford Smith liked to eat. 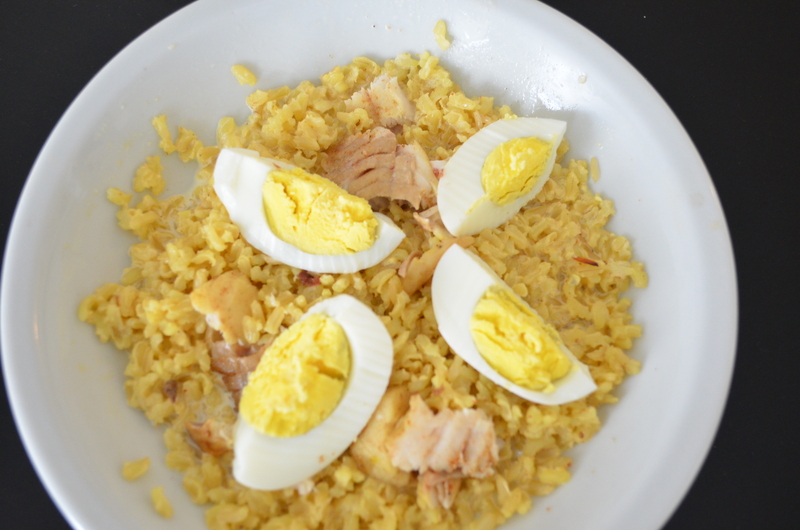 So here’s a recipe for kedgeree, an Anglo-Indian dish that I love on Sunday mornings. I also make it on Fridays when I am camping with my morris dancing buddies. I’ve pulled this recipe out of my head and tried to give reasonable proportions. I just wing it. I use Madras curry powder. Made this today! Cook the rice, drain and keep warm. Flake the fish while the rice is cooking. Melt the butter in a large pan. Blend in the curry powder and add the flaked fish. Sauté gently for a few minutes. Add the cooked rice and blend it with the fish. Add the béchamel and mix well. Serve piping hot garnished with sliced, boiled eggs. You can garnish with tomato slices too if you wish.